20% of generating capacity exists only to meet peak demand, so it runs just 5% of the time and provides just 1% of supply. Peak demand reduction could save billions of dollars. 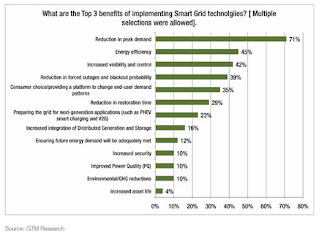 A recent survey of smart grid industry leaders from over 50 North American utilities conducted by GTM Research found that 71 percent identified reduction in peak demand as one of the top benefits of smart grid technologies. While supply and demand is a bedrock concept in virtually all other industries, it is an especially important issue for electric power. Electricity must be consumed the moment it’s generated. Without being able to ascertain demand precisely, at a given time, having the right supply available to deal with every contingency is a problem generally solved with expensive reserves. Since 1982, growth in peak demand for electricity – driven by population growth, bigger houses, bigger TVs, more air conditioners and more computers– has exceeded transmission growth by almost 25% every year. Yet spending on research and development – the first step toward innovation and renewal – is among the lowest of all industries. To respond to high peak demand, utilities build very capital-intensive power plants and lines. Peak demand happens just a few times a year, so those assets run at a small fraction of their capacity. Electric users pay for those idle "spinning reserves" with rate hikes. Shedding loads during peak demand is important because it reduces the need for new power plants. Load Management is a way for utilities to avoid large capital expenditures, and thus keep rates lower overall. In the future, Energy Efficiency will be the fifth fuel (Carbon, Nuclear, Wind, Solar, and EE), but we need the smart grid to make this "virtual fuel" dispatchable in real-time. 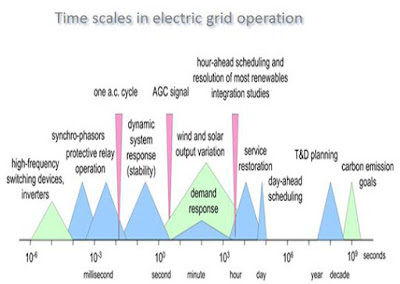 There are many orders of magnitude in the time scale of electric grid operation and load and supply. Different tools must be used to kept in synch for different time scales. Capacity Factor - The average level of production of the peak capacity that is installed and theoretically available. The U.S. electric power industry runs at very low capacity factors—perhaps as low as 40%. 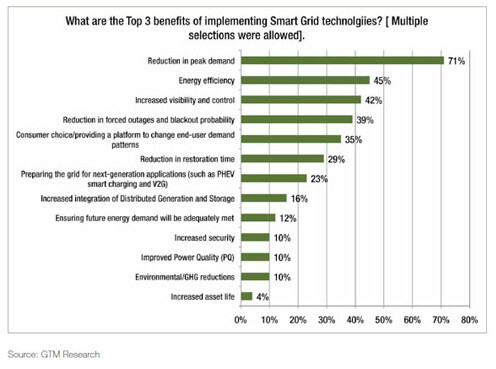 Many of the drivers for a Smart Grid are based on a desire to improve capacity factors by shifting the demand curve through either incentives or controls. Blackstart Recovery – Bringing a power grid back to service after a power outage Generally blackstarts are made more difficult because of the large number of reactive loads attempting to draw power simultaneously at start up when voltages are low. This causes huge overloads that trip local breakers delaying full system recovery. Load management can bring loads back on line in a controlled manner. Contingency Reserves – Contingency reserves are unloaded generation or interruptible load that can be brought on-line within 10 minutes to replace generation which was suddenly lost. Contingency reserves are deployed after frequency response has kicked in. Frequency response stops the frequency decline; contingency reserves bring the frequency back to 60Hz. Curtailment – The right of a transmission provider to interrupt all or part of a transmission service due to constraints that reduce the capability of the transmission network to provide that service, Service is to be curtailed only in cases where system reliability is threatened or emergency conditions exist. Dispatchability - The ability of a given power source to increase and/or decrease output quickly on demand. DLC – Direct Load Control - A utility or system operator remotely shuts down or cycles a customer’s electrical equipment on short notice to address system or local reliability contingencies. In exchange, the customer receives an incentive payment or bill credit. Dynamic Demand - A semi-passive technology for adjusting load demands on an electrical power grid. By monitoring the frequency of the power grid, as well as their own control parameters, individual, intermittent loads switch on or off at optimal moments to smoothen the overall system load, offsetting and reducing spikes in peak-load demand on the grid. As this switching would only advance or delay the appliance operating cycle by a few seconds, it would be unnoticeable to the end user. Frequency Regulation - To ensure a functional and reliable grid, the Independent System Operators (ISOs) that operate the various regional grids must maintain their electric frequency very close to 60 hertz (Hz), or cycles per second (50 Hz in Europe and elsewhere). When the supply of electricity exactly matches the demand (or "load"), grid frequency is held at a stable level. 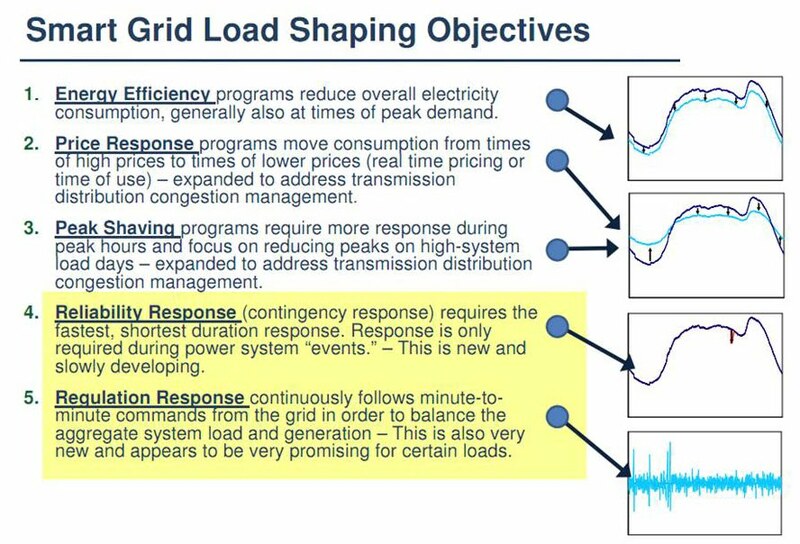 Grid operators, therefore, seek to continuously balance electricity supply with load to maintain the proper frequency. They do this by directing about one percent of total generation capacity to increase or decrease its power output in response to frequency deviations. Not all generators can operate reliably in such a variable way. Changing power output causes greater wear and tear on equipment, and fossil generators that perform frequency regulation incur higher operating costs due to increased fuel consumption and maintenance costs. They also suffer a significant loss in "heat rate" efficiency and produce greater quantities of CO2 and other unwanted emissions when throttling up and down to perform frequency regulation services. Load Shedding – The process of deliberately removing (either manually or automatically) preselected customer demand from a power system in response to abnormal condition top maintain the integrity of the system and minimize overall customer outages. Peak Shaving - Reducing power demand at peak times. Peaking power plants, also known as peaker plants, are power plants that generally run only when there is a high demand, known as peak demand, for electricity In the United States, this often occurs in the late afternoon, especially during the summer months when the air conditioning load is high. The time that a peaker plant operates may as little as a few hours per year, depending on the condition of the region's electrical grid. It is expensive to build an efficient power plant, so if a peaker plant is only going to be run for a short or highly variable time, it does not make economic sense to make it as efficient as a base load power plant. Base load and intermediate plants are used preferentially to meet electrical demand because the lower efficiencies of peaker plants make them more expensive to operate. This animation showcases the virtual power plant concept in the ConEd region of Queens, N.Y., explaining how automated Load Management can be leveraged to improve grid reliability as an alternative to installing additional grid infrastructure. If we can manage demand we can save money. To make investments in energy efficiency and demand response programs payoff, utility system planners and operators, who are responsible for ensuring the reliability of electricity service, must be able to count on demand-side resources to be just as predictable, reliable, and quantifiable as traditional generation resources. The Smart Grid will play a critical role in increasing the reliability and predictability of demand side resources, and quantifying their savings impact, through superior measurement & verification capabilities. The customer was once only treated as a pure revenue source for the utility, but will in the near future treated as a “partner”. Once a ubiquitous communication system is in place linking customers to the utility, monitoring and control of each load will be simplified. Customers will be encouraged through rate programs and incentives to moderate their consumption of energy to allow the utility to avoid the need to purchase power during peak consumption periods. Demand response can be very quick and responsive so that can help with reliability needs. The contingencies to respond to transmission emergencies, for example. If we know where the demand resource is at and it is in the proper location this can be extremely helpful in us responding to those kinds of transmission contingencies. The reliability benefit is, rather than us having to do a broad, firm load shedding, we now have controlled load shedding. We know which customers, where and under what circumstance to use that resource. And so well-defined demand response programs can certainly be very effective in reliably operating the system. Some demand can be shifted permanently. In the agricultural industry there are strategies to shift water pumping to off-hours. But some segments, like hospitals and data centers, will need more complex systems tied to their processes. Cut Peak Power Demand - The extensive use of demand response could potentially cut the peak power demand in the United States by up to 20% in the next decade, according to a 2009 report from the Federal Energy Regulatory Commission (FERC). Curtail Inefficient Peaker Plants - According to the California Energy Commission, during the summer daytime peak, the electric power system is up to 15 percent less efficient mechanically (peaker plants vs. base load plants) and thermodynamically (cooling towers and transmission and distribution are less efficient because of high temperatures). The on-peak system emits 40 percent more CO2 emissions per megawatt-hour than off-peak. 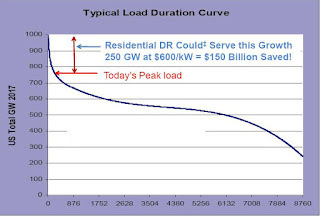 Consumer Disruption - Beyond some point that remains to be determined, there is likely to be some public resistance to the degree of load shifting (and high real-time prices) entailed in the deployment of demand response / load management programs. Lack of Feedback - If we don’t get feedback, then cannot reduce forecast save capacity capital. 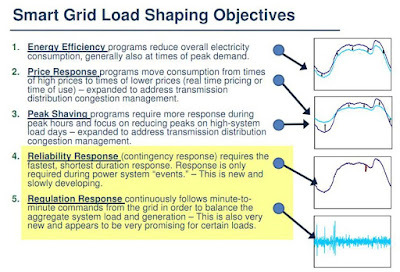 Grid Instability - Pervasive deployment of demand response impacts control system stability. Dirty Baseload Resources - Demand response activities that only serve to shift load from on-peak to off-peak periods may not necessarily save energy. In such cases, even if net energy consumption is the same, if the supply mix is more carbon-emitting during the off-peak period (i.e. greater use of coal) than during the on-peak period (i.e. greater use of cleaner-burning gas fired peakers) the net result of load shifting could be an increase in carbon emissions. Increased Net Energy Consumption - Some demand-responsive load shifting strategies, while economically sound for both consumers and the utility, may increase net energy consumption through a rebound effect in which more energy is used during the off-peak to compensate for energy saved during the on-peak. For example, pre-cooling a building during off-peak hours to avoid running air conditioning at peak, while yielding bill savings for the customer and satisfying peak load reduction objectives of the utility, could result in a net increase in carbon emissions.